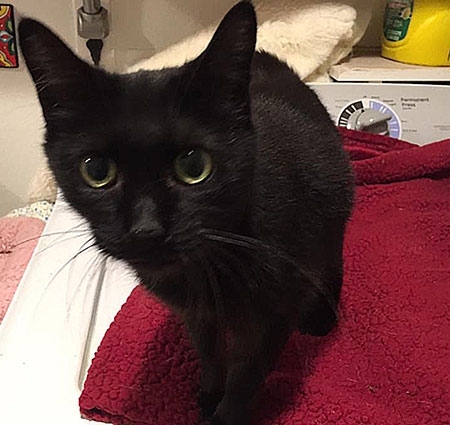 Cricket came to us when our Founder and President, Leticia Stivers helped a 90 year old woman in Austin, Texas TNR over 30 cats on her property. It was an awful situation. Cats were everywhere. The neighbors were threatening to start killing them if something wasn't done. Fortunately, all the cats were fixed and all found homes. The friendly ones were adopted the shelter and the not-so-friendly were placed as barn cats. Among the cats were two mom cats with kittens – Cricket and Momma Cat. It was Spring and the shelters were full, so Leticia fostered the two little families. 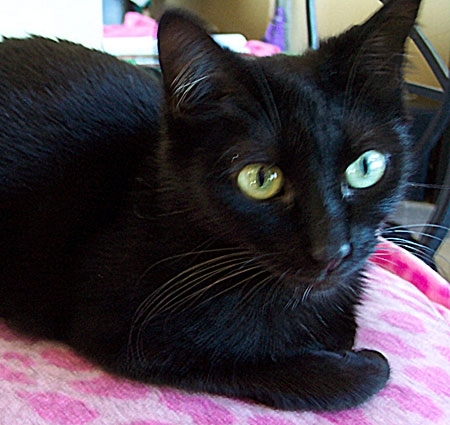 Cricket was a very young mom with 3 newly born kittens. Cricket was a nervous, inexperienced mom. When two of her kittens suddenly died, her last kitten was given to Momma Cat to raise. AHS tried to adopt her out, twice unsuccessfully. 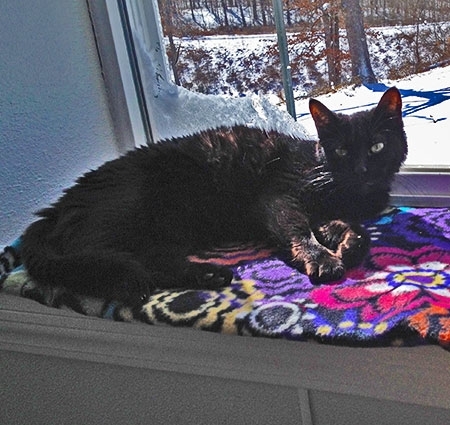 Since black cats are already hard to adopt, adding her nervousness made finding her a home almost impossible. We made her a permanent resident here. She's a very friendly girl who loves her head scratched. You'll often find her jumping around from the highest wall boxes and window beds, which have been designed with Cricket in mind. We will miss this beautiful and sweet girl so much...rest in peace sweet angel.